Glory, glory hallelujah! For the first time ever, a qualified female politician has a real shot at becoming President of the United States. After watching the DNC, and supplementing my viewing with thinkpieces galore on every possible election-related issue, I get it: You're either excited about Hillary's nom, or you aren't. Cool. No harm, no foul. The country, world, and World Wide Web are currently overrun with moderate and extremist views of every kind on what this nomination means for both the future of women and the future of our country. Trolls are out in full force everywhere from YouTube live-stream comment sections to nothing-but-the-facts Internet articles. What's more, our deepest-held sexist views are rising to the surface of men and women alike, coming out in conversations at home, school and work. I know I likely can't reach people who've swung to the far left or right -- those who want Bernie or Trump at all costs -- but I've heard remarks, and made remarks myself, this week that have led me to question why we're saying certain things about Hillary, and what they can tell us about the current state of sexism in our country. Here are five sexist remarks I've heard multiple times from people of all genders, ages and political parties. If you don't agree that they are sexist, we must at least question, then, why we might be saying these things period. 1. It's not wrong for Hillary Clinton to want to be president. Painting her as nefarious because she wants to be president is sexist. A big to-do was make at the convention regarding whether or not Hillary has always wanted to be president, or if she decided she'd like to run for the job later in life. 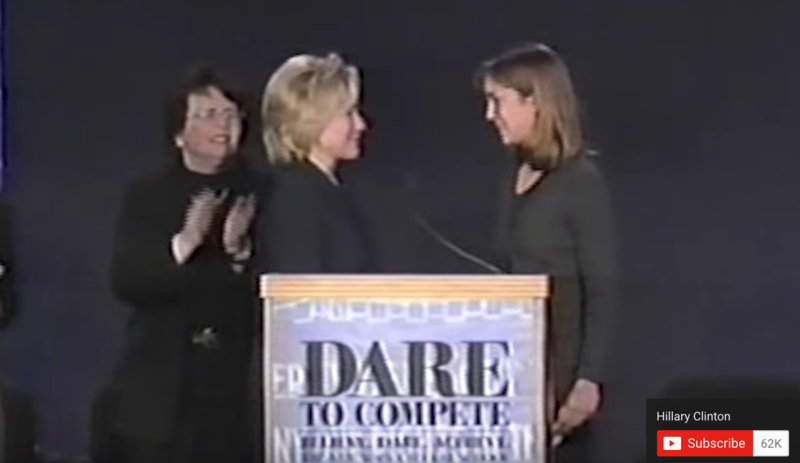 Hillary had already been on record, in both interviews and her memoirs, saying she never considered a career as a politician until the end of her terms as First Lady, when a young female basketball player, Sofia Totti, shook her hand at a public event and said, "Dare to compete, Mrs. Clinton. Dare to compete." What Totti was asking Clinton to do was get in the game the same way she was encouraging women and girls to all over the globe. To enter the competition, not just cheerlead from the bench. It changed Clinton's outlook on the possibilities for her own life, and she went on to run for the Senate. Now that Clinton's inspiration and reasoning for entering the world of politics has been presented to us for our analysis and discussed from every angle, I have a new question to ask: Who cares? Was there even one think piece dedicated to when Bernie Sanders might have first thought to run for president, and if he was evil for imagining himself in the role? 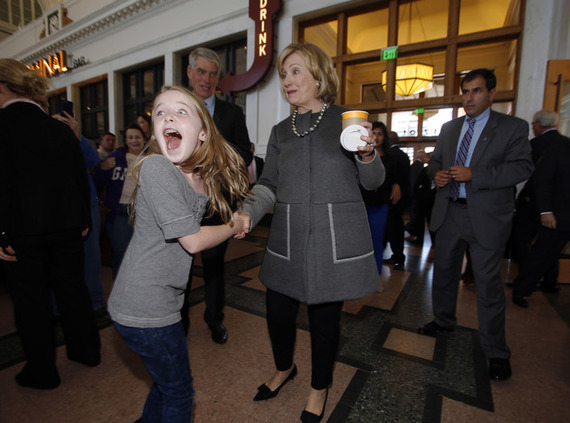 Why do we collectively believe that it's wrong for Hillary to want to be president? So many politicians want to be president. It's the job at the top of their ladder. She clearly wants to do it now. 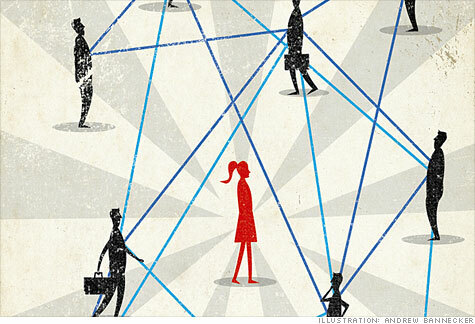 Why can't we say, "Good for her," instead of, "When and why?" 2. It is sexist, ignorant, and insulting to suggest that the political system was "rigged" in favor of a woman succeeding. It is infuriating to me that the most extreme Bernie and Trump supporters are suggesting that the political system was rigged in favor of a woman becoming the democratic nominee. No job in our country, nor perhaps the world, has ever been rigged in favor of a woman securing it. 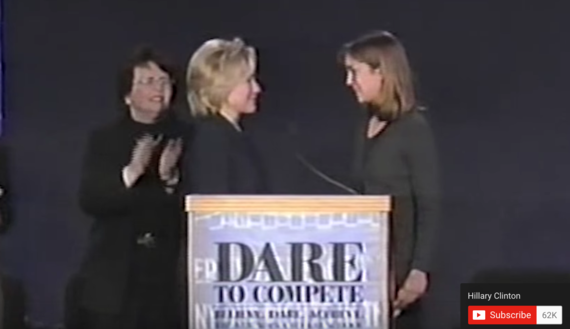 Hillary Clinton is the first woman ever to accomplish what she has, and she didn't do it on her first try. If you truly believe the system was rigged in her favor, please go back to 2008 and stay there. 3. 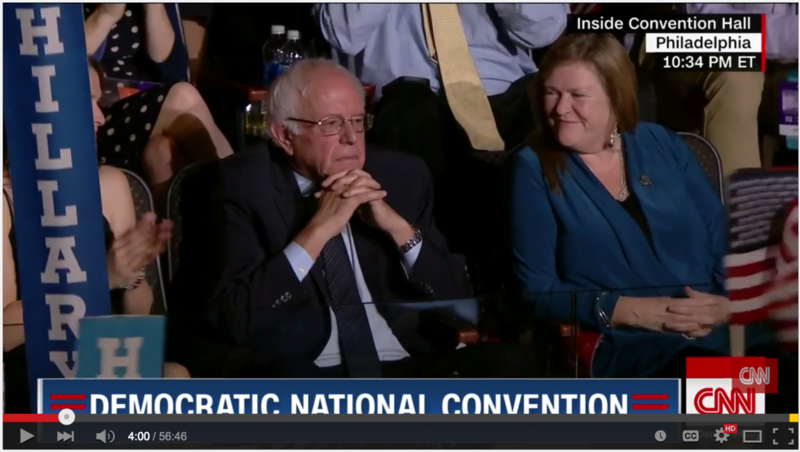 No one told Bernie to smile. Stop telling women to smile. 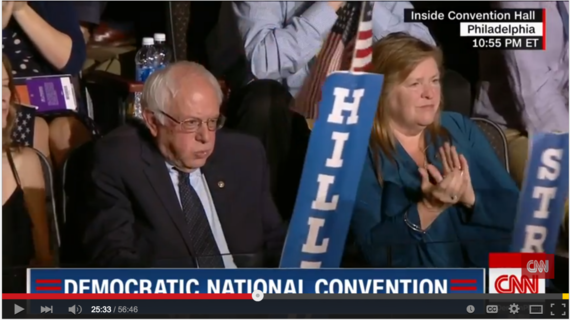 During Hillary's acceptance speech, Bernie Sanders was caught on camera frowning and blowing air out of his cheeks in disgust. I expected to wake up to hundreds of news articles bashing him for his childish behavior. Instead, I didn't find any. Okay, fine. 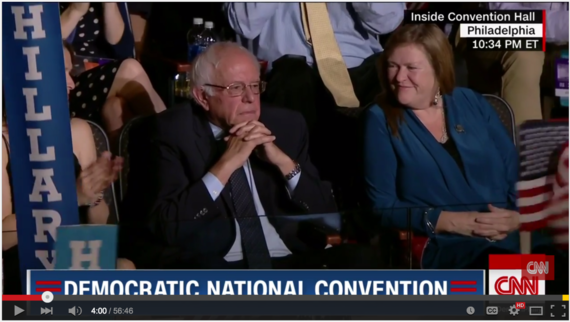 But men and women of the world, the next time you see me frowning on a bad day while walking down the street, or the next time Hillary Clinton is caught on camera frowning during something horrible like the Benghazi hearings, show her the same courtesy that's being shown to Senator Sanders and don't ask me or her to smile. 4. It's great that Hillary will work side-by-side with Sanders to make college more affordable. But don't say she stole his idea -- she didn't. In her DNC speech, Hillary promised to work directly with Senator Sanders to make college affordable, prompting thousands of folks to shout that she's simply using him for his original ideas. But instead of exposing Clinton's lack of originality, they only exposed that they haven't been paying attention. 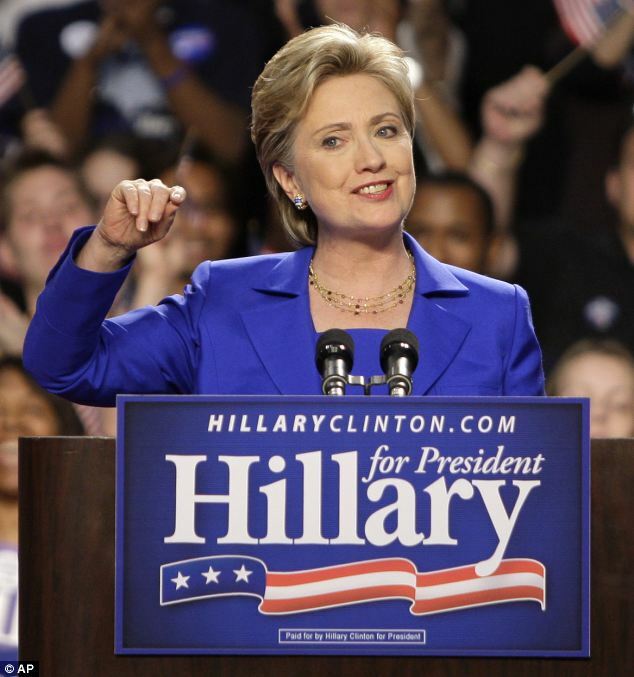 I first started really listening to Hillary and considering her as a viable candidate for president when she was the only Democrat talking about college tuition and loans in 2006 and 2007. She promised that if she were elected president, she would do everything in her power to make college affordable to the middle class, to shut down predatory lenders, and to continue to help non-traditional college students receive an affordable education while working and supporting their families. She called for a Student Borrower's Bill of Rights to give students and families power and leverage when dealing with the private student loan industry, she called for income-based student loan repayment, and an increase of Pell grand funding and funding for AmeriCorps, so that students who gave two years of community service to the country would be written a check toward their higher education. Things have progressed and changed in the past eight years, and Clinton's new college plan has adapted with those changes. It's inspiring and hopeful that Clinton publicly agreed to continue to work with Sanders on these matters, but please stop saying she's stealing his initiative. 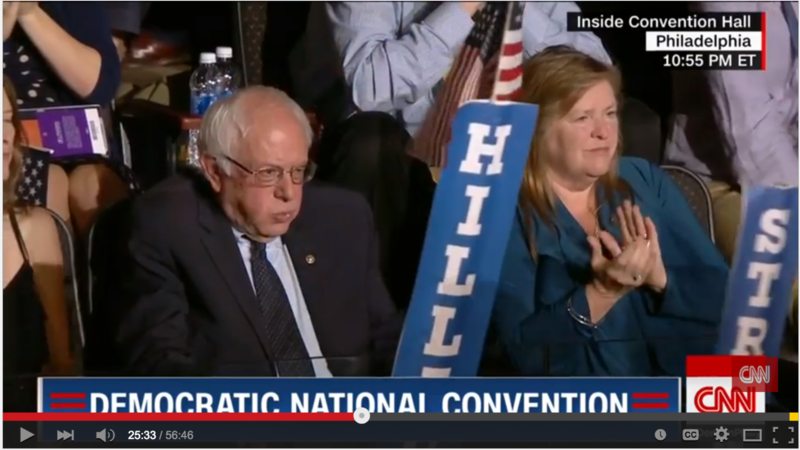 It has been her initiative as well for quite a long time, predating Sanders. To ignore what Clinton has done and said regarding any political issue is to prove that you simply haven't cared to listen to her seriously. 5. Don't try to make me feel bad or undermine my intelligence because I appreciate the historical significance of Hillary's nomination from a feminist perspective. Just like it's not wrong for Hillary to want to be president, it's not wrong for me to want a female presidential candidate and president because I am a woman. Yes, being a woman has made me more invested in this election. Yes, I can see how Hillary Clinton becoming Commander in Chief will directly impact my life because I am a woman. There's nothing wrong with that. Stop trying to convince me that Hillary being a woman shouldn't matter. That's exactly the line of thinking that keeps women's rights plateaued instead of moving forward.